I am an academic at the University of Derby where I have been employed since 2013. My prior academic career was at Newcastle University, where I was awarded both my degree and my doctorate. Between my degree and my PhD, I spent just short of four years traveling around the world as a research assistant for numerous scientific projects. These included biodiversity index surveys in the Philippines and Malaysia, radio tracking Sumatran rhinos in Borneo, rehabilitation and management of the endangered black robin in the Chatham Islands, New Zealand and being a game ranger in mainland Africa and Madagascar. Since completing my PhD, I have published over 60 research articles in peer reviewed journals in the past 7 years. Currently, in addition to my teaching responsibilities at the University, I am the manager of the Aquatic Research Facility which was funded through my partnership with SeaLife. I have a strong passion for the importance of public engagement in science as evidenced through my various engagements with schools and public groups at science outreach events. I always aim to regularly disseminate my research findings and conduct this through invitations to academic conferences and specialist seminars. To date, I have won numerous awards including the Charles Darwin Award lecture from the British Science Association and staff excellence awards at the University of Derby. I am currently the director of studies for eight PhD students and two masters, and supervise numerous undergraduate research projects in their final year of study. We also have three Post Doctorate Research Associates working within our group. I am currently teaching on a wide range of modules throughout years 4,5,6 and 7. Modules include; Evolution of Life, Ecosystems, Molecular Biology, Rainforests, Deserts and Oceans, Habitat Management, Tropical Marine Biology, Biology in Practice and Ecological Consultancy. I also supervise students on their 3rd year Independent Research projects, Masters projects and PhDs. My Major Research Interests are in epidemiology, microbial interactions with hosts, the roles pathogens play in disease causation, immune responses of hosts to specific diseases and ways to manage or mitigate spread of disease. My main focus is marine biology, and in particular I focus on coral reefs and tropical oceans. I do, however, also work with nanoparticles and eDNA. James Robson - Quantification of the impacts environmental parameters have on Jellyfish development, growth and reproduction. Martin Stelfox - The issue surrounding ghost gear in the Indian Ocean. Please enquire - only self funded PhDs are available at the moment. I am a member of the Coral Aquarist Research Network (CARN), the Society of General Microbiology, the Society of Invertebrate Pathology and the International Society of Reef Studies. Sweet, MJ. 2016 Describing novel diseases associated with aquaculture and the use of eDNA as an early detection of potential pathogens. Newton Researcher Links Workshop "Scientific, technological and social solutions for sustainable aquaculture in Thailand: a key player in global aquatic food supply"
Sweet, MJ. and Bythell, JC. 2012 Are Ciliates Key Infectious Agents of Coral Diseases? International Coral Reef Symposium in Cairns. Sweet, MJ. 2010 Bacterial assemblages differ between compartments within the coral holobiont. International Society for Reef Studies in Amsterdam. Leal MC, Sheridan C, Kramarsky-Winter E, Sweet MJ, Kushmaro A. 2012 Diseases in coral aquaculture: causes, implications and preventions. AQUA (European and World Aquaculture Society Meeting), Prague, Czech Republic. Sweet, MJ. 2012 Survey methods for coral disease. International workshop on monitoring and survey methods in coral reefs. School of Marine Studies, University of the South Pacific, Fiji. We offer a microbial analysis service to anyone interested in research or specific pathogen identification. Our particular focus at the moment is with the aquarium industry, zoos and aquariums. We also work on eDNA as a Molecular Consultant with Surescreen and a Marine Advisor for Brindle and Green Ecological Consultancy. My work has taken me all over the world to conduct field based research, present lectures and attend or host workshops. My research has received considerable press coverage. Also please follow me on twitter @DiseaseMatters for regular updates and interesting tweets about my work and related topics. Lerebours, A, Sweet MJ et al. 2016 Molecular changes in skin pigmented lesions of the coral trout Plectropomus leopardus. Marine Environmental Research 120: 130-135. Johan O, Sweet MJ et al. 2016 Prevalence and Incidence of Black Band Disease of Scleractinian Corals in the Kepulauan Seribu Region of Indonesia. Diversity 8, 11. Chandler JF, Sweet MJ, et al. 2016 Influence of Resource Availability on the Foraging Strategies of the Triangle Butterflyfish Chaetodon triangulum in the Maldives. PloS one: e0151923. Williams AD, Sweet MJ et al. 2015 Age-Related Shifts in Bacterial Diversity in a Reef Coral. PloS one, 10(12). Johan O, Sweet MJ et al. 2015 The distribution and abundance of black band disease and white syndrome in Kepulauan Seribu, Indonesia. HAYATI Journal of Biosciences. Pisapia C, Sweet MJ et al. 2015 Geographically conserved rates of background mortality among common reef-building corals in Lhaviyani Atoll, Maldives versus northern Great Barrier Reef, Australia. Marine Biology 162.8 (2015): 1579-1586. Smith D, Sweet MJ et al. 2014 A novel investigation of a blister-like syndrome in aquarium Echinopora lamellosa PLoS one 9(5), [e97018]. Sweet MJ, Bythell JC. 2012 Ciliate and bacterial communities associated with White Syndrome and Brown Band Disease in reef building corals Environmental Microbiology: 14(8):2184-99. 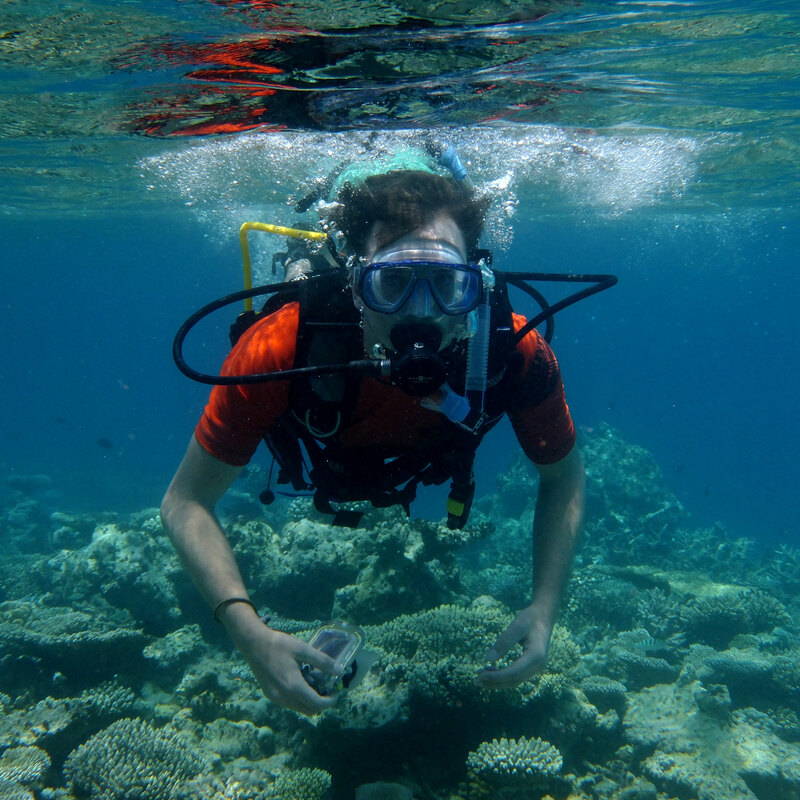 With World Oceans Day today highlighting the issue of plastic pollution, Dr Michael Sweet, Associate Professor in Aquatic Biology at the University of Derby, looks at the impact plastic has on coral and other marine life.